Looking for a sweet treat for my sweetheart can be a little tricky if you don’t want cookies, pastries, etc. around the house. Instead of desserts sitting around the house they typically find themselves sitting on my thighs! Let me offer this wonderful dessert that can be served in 10 minutes or less. That makes this not only a healthy option, but a wonderful alternative to a laborious pie. The grilling makes the sugar in the fruit begin to caramelize and tastes like an individual serving of summer. This Labor Day weekend we took advantage of all that DuPage County, IL has to offer. We are blessed with a tremendous amount of things to do around here that are absolutely free. For instance, we visited Kline Creek Farm which is a farm that has been restored to reflect the 1890s. 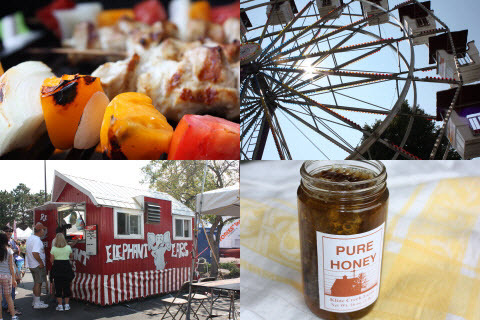 They have animals, a tour of the farm house, and harvest their own honey. I of course had to take a jar of the honey home for my own immediate consumption. As you probably already aware, honey is a natural antiseptic and can be used as a natural remedy to allergies. Keep your local honeybees employed! Buy local! 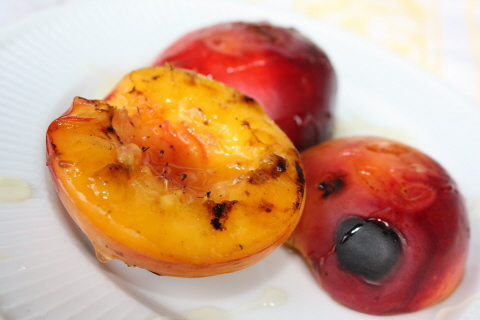 Place nectarine halves onto preheated grill. Flip once when grill marks appear. Grill on the opposite side, and remove from heat once grill marks appear. Drizzle with honey and relax…dessert is done!